Head coach Randy Wittman attributed the recent five-game winning streak and better offense to “making the simple plays” and not turning the ball over too much. Two days removed from cruising by the Hawks in Atlanta, the Washington Wizards were looking to continue the momentum on their home court. After a pleasant start the game, Washington’s lack of perimeter defense caught up with the home team in the fourth quarter as the Hawks had a season-high 17 3-pointers. As a result the Wizards got blown out 122-101 and have still failed to get above .500 since November 24. It was again the road team that got off to the fast start, but Washington quickly nipped that in the backside with a 12-0 run of their own. After taking just two shots two night ago, Kyle Korver made an immediate impact for Atlanta tonight by draining his first two 3-point attempts. Washington got a 25-15 lead midway through the first behind John Wall’s five assists in the game’s first six minutes. 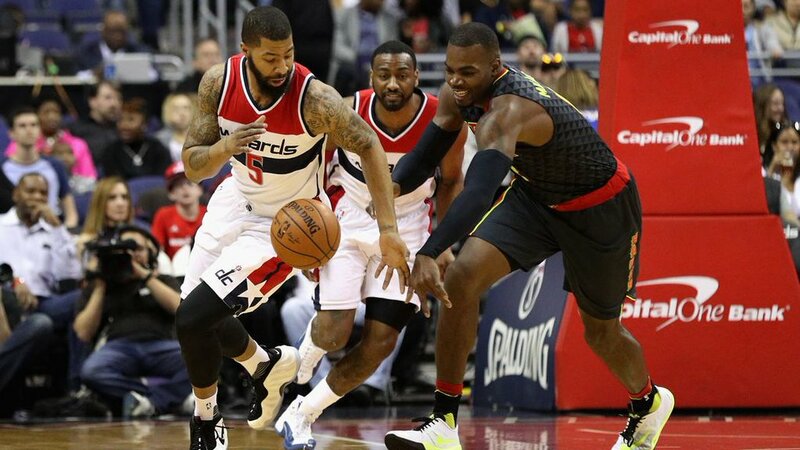 The Hawks made their run while Washington went scoreless over the final four minutes, but after one period the Wizards led 25-22. Extending back into the first quarter, Atlanta was on a 16-3 run that gave them a three point advantage early in the second quarter. With five ties and six lead changes in the quarter alone, a back and forth pace ensued. The Hawks attempted a whopping 22 3-pointers in the half, many of which were open, but luckily only eight went through otherwise Washington would have been in big trouble. With Garrett Temple on the bench with two fouls and Alan Anderson continuing to deal with an ankle injury, the home squad got an unexpected lift from mid-season pick up Marcus Thornton who had six points in the quarter. Finishing the quarter on a 7-0 run, Washington had a 56-52 lead at intermission. Markieff Morris hit a couple of jump shots to pace the Wizards early, but the home team could not increase their lead to more than four points. Towards the end of the quarter, the Hawks rattled off a 12-0 run while Bradley Beal was on the bench. Thornton hit a much needed 3-pointer to stop the bleeding monetarily but the Wizards went into the final quarter down 81-75. The torture continued in the fourth quarter as sloppy offense and turnovers saw the deficit ballooned to 17 with Atlanta going on an 11-0 run. Every time the Wizards seemed to have an answer, whether it be a Thornton or Morris 3-pointer, the Hawks came back and hit one of their own. The road team shot seven of twelve from beyond the arc in the final quarter and things were ugly for a team that is supposedly fighting for their playoff lives. The last two minutes of play highlighted garbage time play from Kelly Oubre Jr. and the Wizards fell 122-101. Before heading out on a five-game West Coast road trip, the Wizards will welcome the Minnesota Timberwolves for a Friday night showdown. The Washington Wizards continue to be undermanned as starters Bradley Beal (right leg stress reaction) and Otto Porter (left thigh bruise) continue to sit out for Randy Wittman. Things got worse today as the Washington Post’s Jorge Castillo reports Alan Anderson, Washington’s best defender according to Marcin Gortat, will be sidelined an additional three to five weeks as he recovers from left ankle surgery. Point guard John Wall has been single-handedly willing the Wizards along in December, a month where he is currently averaging 23.6 points, 11.5 assists, 4.7 rebounds, and even 41.2 percent shooting from beyond the arc per game. Things were no different tonight as Optimus Dime pace Washington with nine first half assists. 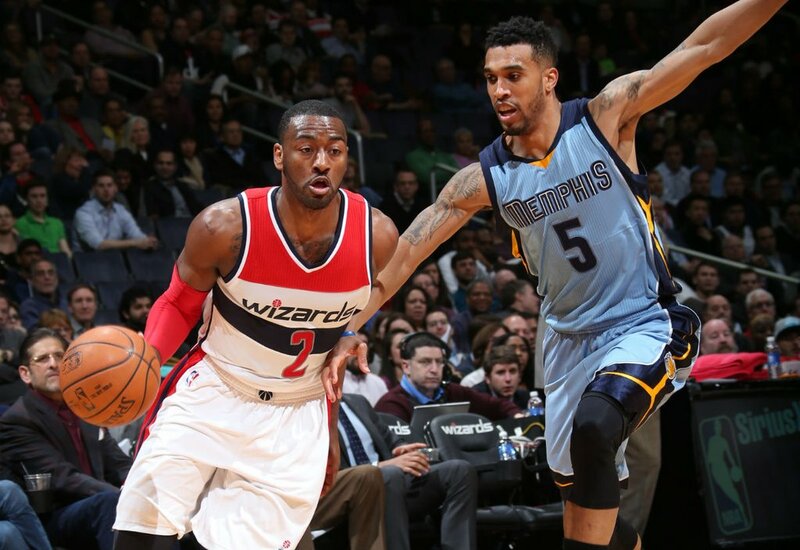 The All-Star hopeful recorded his fifth straight double-double at home as the Wizards went on to win 100-91. With the loss of “The Truth” Paul Pierce, many people think the Washington Wizards are going to take a step back this season, but anyone who carefully watched how Otto Porter performed in the playoffs knows the team will be just fine. Along with Porter, the Wizards smartly moved up in the draft to select Kelly Oubre Jr., used their mid-level exception to sign Alan Anderson, and still have a now healthy Martell Webster on the roster. For the discussion in this article, we will not consider Gary Neal or Jared Dudley as small forwards although they probably will find themselves playing the wing position during the season. In the playoffs, Otto Porter, the former 3rd overall pick out of hometown Georgetown, turned into the player Washington expected out of him two years ago. His development was hindered for much of his rookie season because of an early hip injury; however under the mentorship of future Hall of Famer Paul Pierce, Porter grew up quickly. It is common knowledge now; John Wall is one of the best point guards in basketball right now, arguably in the same tier as the elite Steph Curry, Russell Westbrook, and Chris Paul. With the proneness to injury of Kyrie Irving and Derrick Rose, to me there is no question that the Washington Wizards boast the best point guard in the Eastern Conference. Although Wall is a solid scorer and even better distributor with of the basketball, he cannot play 48 minutes a game during an 82 game season; it is physically impossible. That is where eight-year veteran Ramon Sessions, 29, comes into play. Sessions told me during Wizards Media Day, that he feels great about knowing what system he is going to be playing in the following season during the offseason. Below you will find everything you need to know from all of the Washington Wizards players, organized by position. The major theme from all parties, which was presumed by the free agent acquisitions, was that the goal is to get past the second round of the playoffs and the team will follow the trend set out by the Golden State Warriors of going small to spread the floor. Drew Gooden, 33, has been a big part of the Wizards playoff run the past two seasons. As a result, not only did Washington resign the Kansas graduate to a veterans minimum ($1.5 million), but they signed him to a one year deal worth $3.3 million. Drew Gooden goes back to Wizards: 1 year, $3.3M, per source. @WojYahooNBA first with agreement. Wiz have done nice job adding depth. With the trade acquisition of Jared Dudley, which became official today once the moratorium was lifted, the Wizards have a stretch four. However, Dudley is not the greatest of rebounders, averaging just over 5 boards in a 36 minute period in his career. With the Wizards only having two big men that Randy Wittman trusts to play during the playoffs: Marcin Gortat and Nene, it made sense for Washington to add another big man. Gooden has a natural drive and energy he brings to the team. At 6′ 10”, the veteran stretch four always seemed to be soaring into the Verizon Center rafters to corral loose balls against the Toronto Raptors in the playoffs. Gooden might only be credited with 3.1 win shares for the Wizards over the past two regular seasons, but his 46.2 percent (12/26) shooting from beyond the arc last postseason to go along with his 5.5 rebounds per game in limited playing time was key. His performance in high leverage situations as well as his likability in the locker room made this a no-brainer. Gooden is clearly happy to be back. I want 2 thank the Leonsis Family, and the entire Wizards organization 4 giving me another opportunity to compete for a ring! DC I'm back!!! Other teammates likes Wizards leader John Wall also is joyful about the move. The Wizards now have the maximum of 15 players currently under contract meaning there is little likelihood, at the moment, of signing an additional player off of the summer league team besides first round pick Kelly Oubre. Unless the Wizards are able to offload the contracts of Martell Webster, DeJuan Blair, and even last year’s starting power forward Nene, who currently do not fit into the way the Wizards are shaping their team, rookies like Dez Wells might have to look for work elsewhere. The Wizards are now fully committed to the small ball mentality that the NBA’s best teams are transitioning to with their free agency acquisitions of Jared Dudley, Gary Neal, Alan Anderson, and now Drew Gooden. For the latest on the rest of the Washington Wizards offseason building up to the start of the regular season, come back and visit District Sports Page regularly. The Washington Wizards have lost Paul Pierce, acquired Jared Dudley, signed Gary Neal, and now added Alan Anderson as another piece of the puzzle heading into the 2015-2016 season. With these three acquisitions Washington has used up their larger trade, bi-annual, and most of the mid-level exceptions hinting towards the possible end of major transactions during the free agency festivities. Anderson declined a player option with the Brooklyn Nets that would have paid out a mere $1.3 million. After losing out on veteran PF David West talents to the Spurs, Ernie Grunfeld wasted little time to use up the MLE on what many considered the best wing option still available in Anderson. Anderson will only receive part of the Wizards mid-level exception ($5.5 million) meaning that the team could use the remaining $1.5 million to sign another player. Such an amount might not be much to some, but it would be similar to the veterans minimum that David West settled for. The remaining portion can be used to sign another player. The signing will not be official until the NBA moratorium is lifted on July 9, similar to Jared Dudley’s situation. Free agent Alan Anderson has agreed to a one-year, $4M deal with Washington, league source tells Yahoo Sports. Alan Anderson, 32, is a 6′ 6” wing defender out of Michigan State and has plenty of experience both in the NBA and overseas. Anderson is another shooter for the Wizards as he is 34.6 percent from beyond the arc for his career including 252 made threes over the past three years. Anderson was also big in the playoffs last year for the Nets as a bench player by averaging 11 points in 24 minutes a game. 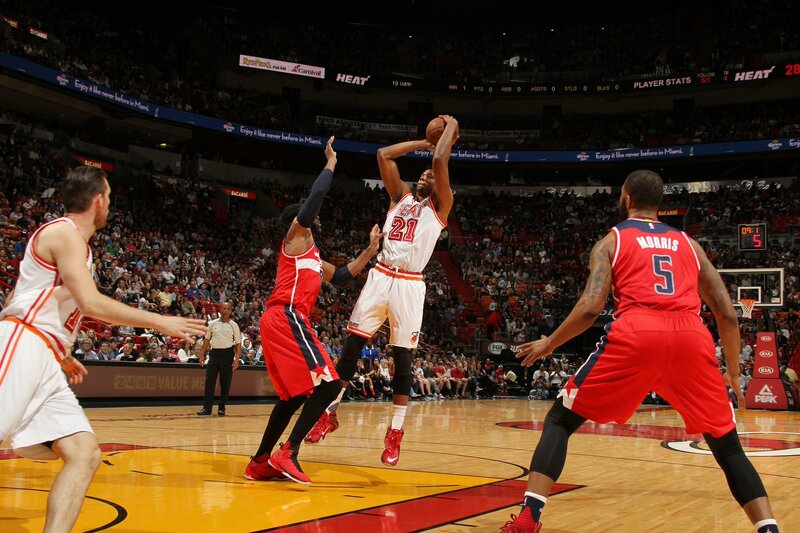 Like The Truth, Anderson heated up in the postseason with a ridiculous 10 of 16 (62.5 percent) shooting from three. Possibly even more importantly for Anderson was his versatility and ability to effectively defend against the rest of the league’s premier wing players like LeBron James, similarly to Jared Dudley. With the additions of Anderson, Neal, and Dudley, the Wizards have deepened their team at the 2, 3, and 4 positions. Anderson will be the most comfortable at the SF position and by backing up rising star Otto Porter , the Wizards can ease Kelly Oubre’s development with limited playing time. The move also allows Dudley to play primarily at the PF position, though possibly in a non-starter role. Washington has obtained versatility, wing depth, and shooting without forfeiting any future cap space for next year’s run at Kevin Durant. Washington currently has 14 players under contract and have limited big bodies to rebound the ball at the moment. Although the Wizards have previously opted to leave a roster spot open for a strong Summer League performer such as Rasual Butler last year or Dez Wells this year, there is a strong possibility that the Wizards will take the $1.5 million left of their mid-level exception and re-sign Drew Gooden. Gooden has preformed well for the Wizards the past two years, especially in the playoffs, and excels in rebounding because of his energy. Unprobable at the moment, the Wizards may try to move the likes of Martell Webster of DeJuan Blair because of their near certainty of no playing time, as projected by the late stages of last season. Such would bode well for former Terp Dez Wells or another young standout in the upcoming Summer League. To make sure you are aware of the latest Wizards developments, check back on District Sports Page frequently. NBA Free Agency is a mad house for all 30 teams and impossible to keep track of for the ordinary fans on their own. To get an idea of just how crazy the first day of NBA free agency was alone, teams agreed in principle to $1.4 billion in salaries. With the Wizards losing out on the services of The Truth, it is possible that they will be a bit more active this year. However, the Wizards are still hoping for the services of home town product Kevin Durant nest summer so all their moves until then will have the #KD2DC movement taken into account. Wizards have essentially no cap room but can use mid-level, bi-annual, and trade exceptions. UPDATE: Wizards have used their larger trade exception, bi-annual exception, and most of their mid-level exception on Jared Dudley, Gary Neal, and Alan Anderson, respectively. The following list of individuals who the Wizards have been reportedly linked to (this list will be updated at all times). Derrick Williams: Former King and second overall pick behind Kyrie Irving is an undersized power forward that was possibly asked to do too much. Williams has now agreed to a 2 year $10 million deal with the New York Knicks. Wayne Ellington: Former Timberwolves first round pick, last year with the Lakers, the shooting guard has a stroke from beyond the arc. Ellington signed a two year deal with the Brooklyn Nets, who look to replace now Wizards Alan Anderson, worth $3.068 million. Mike Dunleavy: The Bulls veteran three point threat who was a thorn in the Wizards side in the 2014 playoffs. The former Duke product would go on to resign with Chicago at 3 years for $15 million although he was rumored to have had other offers. Rodney Stuckey: The longtime Piston combo-guard was an interest of the Wizards because of his consistent double digit points per game production. Stuckey resigned with the Pacers at 3 years for $21 million. Alan Anderson: Former Net is an interest of the Wizards for wing depth and potentially as a replacement for Pierce. 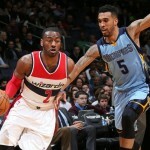 Anderson signed a 1 year/$4 million deal with the Wizards using up part of the team’s mid-level exception. C.J. Watson: The well traveled point guard was in interest of the Wizards two years ago for his three point ability, something that both John Wall and Ramon Sessions lack. The former Pacer has again drawn the Wizards interest. Watson would go on to sign a 3 year $15 million deal with the Orlando Magic. Chris Copeland: The former Knick and Pacer could be a candidate for the Wizards at stretch 4, which is widely believed to be Washington new #1 priority. After shooting the ball with great accuracy from beyond the arc in his first two seasons in the league, 42 percent (92 of 219), the Virginia native shot a woeful 31 percent (52/167) from deep last year. Copeland signed a one year deal with the Milwaukee Bucks in the amount of $1.15 million. David West: The longtime Hornet (New Orleans) and Pacer is a better version of Nene as he is a more consistent pick-and-pop shooter and more efficient from the free throw line. West might not take the mid-level exception ($5.5 million) after opting out of his $12.6 million option, so unless the Wizards are able to make cap room by trading away Nene, they might lose out to San Antonio or Cleveland. The veteran PF signed with the Spurs for the veterans minimum. Although West thinks that he will have a better chance of winning a title with the likes of Tim Duncan and LaMarcus Aldridge, the fact that the Wizards are vying the interest of quality free agents is promising with next summer approaching. Gary Neal: The former Towson Tiger is returning to the DMV area on a 1 year deal for $2.1 million that will use the Wizards bi-annual exception. Neal fills the three point shooting hole for the Wizards, as behind Bradley Beal (after the departure of Pierce), John Wall made the second most three pointers (20) for the team after the all-star break. Kevin Seraphin: The backup center for the Wizards last year is looking for an opportunity to start, but that does not mean the Wizards are still not interested in returning the services of the French native. The Lakers (although they have acquired Roy Hibbert), Suns, and Spurs (if they miss out on David West) are also reported to be interested in Seraphin. Another option for the Wizards is the signing of Seraphin with the mid-level exception and then trading him to a team like the Clippers who have a void after not resigning DeAndre Jordan. Seraphin signed with the New York Knicks on a 1 year deal worth $2.8 million, sacrificing the money now in hopes of cashing in next summer. Drew Gooden: The veteran stretch four signed another one year deal with the Wizards, this time for more than the minimum because of his higher value during the last two playoff runs. The Wizards acquired Jared Dudley from the Bucks, which may take the Wizards out of the running for names like Williams and Copeland. They could instead decide to heavily purse a wing player with their mid-level exception worth $5.5 million, but the pickings are becoming mighty slim. With little cap space and no desire to take away any money from a run at Kevin Durant next summer, the Wizards will likely be done with major transactions especially as their roster is now full with guaranteed contracts. For the latest on everything Wizards leading up to the 2015-16 season, return to District Sports Page frequently.